The thyroid is a small butterfly-shaped gland located at the front of the neck, and it performs a critical function: secreting hormones that regulate the metabolic and growth functions within the body. It only weighs only about 20 grams, and most of the time, people don’t give much thought to it—it just does its job. But if something goes awry and it becomes hyperactive or underactive, it can greatly impact how you feel. Over 200 million people globally suffer from thyroid issues, which affect women four to seven times more than men. Many sufferers have no clue that they even have an issue, because they don’t know what the symptoms are. 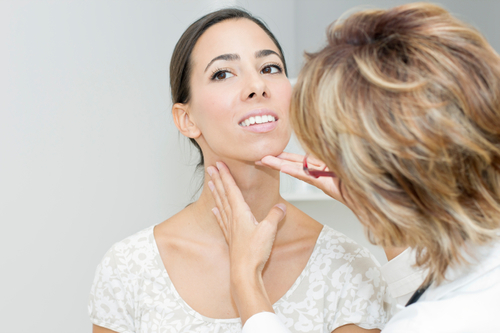 Let’s take a closer look at the differences between hypothyroidism vs. hyperthyroidism. Hypothyroidism is when the thyroid gland is not performing as actively as it should and secretes less thyroxine (the thyroid hormone) than is required. It’s also called an underactive thyroid, and affects mostly women over the age of 60. Because it’s hard to spot, with few symptoms in the early stages, it can go undetected for years until the health issues like joint pain, obesity, infertility, and heart problems start to crop up. Once diagnosed, an underactive thyroid can be treated with synthetic thyroid hormones. When the body doesn’t make enough thyroxine, the body processes slow down; that’s why there is almost crippling fatigue with hypothyroidism. When fatigue carries on indefinitely, it’s time to visit your healthcare provider to discuss the possibility of an underactive thyroid. Many things can cause hypothyroidism, but the most common is Hashimoto’s disease, an autoimmune disorder, in which the body attacks the thyroid, inflaming it and reducing its function. The difference between hypothyroidism and hyperthyroidism is the amount of thyroxine secreted. When the thyroid is overactive, it creates too much thyroxine, and, like an underactive thyroid, this causes issues in every area of the body. Hyperthyroidism, also known as Graves’ disease, can accelerate the metabolic system causing drastic weight loss, profuse sweating, heart palpitations, irregular heartbeats (which can mean too fast or too slow, or anything outside the normal rhythm), anxiety, and irritability. The combination of these symptoms is worth a trip to the doctor to sort out any thyroid issues. The faster a diagnosis is made, the quicker a treatment plan can be developed to get you on the path to feeling yourself again. One course of treatment involves radioactive iodine, which helps slow down the creation of excess thyroxine. Medication and dietary changes are other methods of treatment. Below is a hypothyroidism vs. hyperthyroidism table, detailing the symptoms for each condition. The difference between hypothyroidism and hyperthyroidism is easy to explain. Hyperthyroidism revs up the body much like a car revs up when you hit the gas. The excess thyroxine produced by the body causes it to go into overdrive, hence the sleeplessness, diarrhea, tremors, and irritability. Basically, the body is kicked up and on edge. Patients have described suffering with an overactive thyroid as years of unending agony because of the severe itching of the skin, sleepless nights, anxiety, increases in blood pressure, hot flashes, and headaches. Your body feels as though it is attacking you, as though it’s difficult to be at ease in your own skin. Hypothyroidism, on the other hand, does the opposite. An underactive thyroid creates a shutdown effect in the body. You feel incredibly tired and fatigued, like you could sleep all day because you simply have no energy. You gain weight because your metabolism becomes sluggish and you aren’t moving nearly as much as you used to. It can be mentally unnerving for people who are used to being alert and active all the time. Hypothyroidism can really knock a person off their game and without knowing why it has happened, it can cause a lot of mental anguish. When such drastic changes in mood, behavior, and energy levels strike, it’s imperative to discuss it with a doctor to try to get you back to normal, especially since the underlying condition can be treated. So, hypothyroidism vs. hyperthyroidism: which is worse? There isn’t a simple answer. Both feel awful in their own way, whether it’s a matter of being anxious, nervous and irritable, or feeling sleepy and drained, and gaining weight rapidly. Approximately one percent of the U.S. population has hyperthyroidism, whereas hypothyroidism is much more common, affecting five percent of the population 12 and over. Medically, however, hyperthyroidism may have more concern attached to it because of the possibility for high blood pressure, which on its own can lead to heart attack and stroke. The key similarity between hypothyroidism and hyperthyroidism is the thyroid and its production of thyroxine. But there are some symptoms that both conditions share, such as the development of a goiter, as well as muscle weakness, hypertension, and a loss of libido. Erectile dysfunction is a shared symptom across both conditions, and so is itchy skin and hair loss. As unbelievable as it sounds, some people can and do suffer from both thyroid issues, though the symptoms don’t present themselves simultaneously. It could be a flare-up of thyroiditis, in which the patient has hypothyroidism but the thyroid occasionally goes into overdrive, presenting symptoms of hyperthyroidism, even though it’s still on its way to burning out. So you might experience weight loss and fatigue (and yet still feel hyperactive), plus nervousness, and then a few months later the opposite starts to happen: crushing fatigue, weight gain, depression, and dry skin. In some rare cases, Hashimoto’s disease and Graves’ disease coexist in the patient, putting them through cycles between an overactive and underactive thyroid. If you have hypothyroidism with hyperthyroidism symptoms, talk to your doctor about getting a full antibody profile to determine if both are, in fact, present. Diet plays a big role in managing thyroid issues, but when considering hypothyroidism vs. hyperthyroidism diets, both will have different foods that need to be avoided or included. Below are food lists for both major thyroid conditions. See your doctor regularly so progress can be measured. Thyroid medication should not be used to lose weight. Weight will be regulated on its own once the thyroid is under control. If you’re diabetic, keep track of your blood sugar levels as directed by your doctor. Note that thyroid therapy can cause temporary hair loss. Sleeping at night for at least seven hours. “Thyroid Disease: Know the Facts,” Thyroid web site; http://www.thyroid.ca/know_the_facts.php, last accessed March 21, 2016. “Hypothyroidism vs. Hyperthyroidism: What’s the Difference?” Everyday Health web site; http://www.everydayhealth.com/thyroid-conditions/hypothyroidism-vs-hyperthyroidism-whats-the-difference.aspx, last accessed March 21, 2016. “Hypothyroidism (Underactive Thyroid),” Web MD web site; http://www.webmd.com/women/hypothyroidism-underactive-thyroid-symptoms-causes-treatments, last accessed March 21, 2016. “Hypothyroidism (Underactive Thyroid),” Mayo Clinic web site; http://www.mayoclinic.org/diseases-conditions/hypothyroidism/home/ovc-20155291, last accessed March 21, 2016. “Hyperthyroidism (Overactive thyroid),” Mayo Clinic web site; http://www.mayoclinic.org/diseases-conditions/hyperthyroidism/basics/definition/con-20020986, last accessed March 21, 2016. “Hyperthyroidism,” Healthline web site; http://www.healthline.com/health/hyperthyroidism, last accessed March 21, 2016. “Hyperthyroidism vs. Hyperthyroidism Differences in Signs, Symptoms,” HealthHype web site; http://www.healthhype.com/hypothyroidism-vs-hyperthyroidism-differences-in-signs-symptoms.html, last accessed March 21, 2016. “Hyperthyroidism vs Hyperthyroidism,” Diffen web site; http://www.diffen.com/difference/Hyperthyroidism_vs_Hypothyroidism, last accessed March 21, 2016. “Can You Be Both Hypothyroid and Hyperthyroid?” About Health web site; http://thyroid.about.com/cs/hypothyroidism/a/hypoandhyper.htm, last accessed March 21, 2016. “9 Foods to Avoid with Hypothyroidism,” Everyday Health about health web site; http://www.everydayhealth.com/hs/thyroid-pictures/foods-to-avoid/, last accessed March 21, 2016. “7 Hypothyroidism-Friendly Foods to Add to Your Diet,” Everyday Health web site; http://www.everydayhealth.com/hs/thyroid-pictures/foods-to-eat/, last accessed March 21, 2016. “5 Foods That May Help with Hyperthyroidism Symptoms,” EndocrineWeb web site; http://www.endocrineweb.com/conditions/hyperthyroidism/5-foods-may-help-ease-hyperthyroidism-symptoms, last accessed March 21, 2016. “Foods to Avoid with Hyperthyroidism,” Livestrong web site; http://www.livestrong.com/article/410412-foods-to-avoid-with-hyperthyroidism/, last accessed March 21, 2016.
http://www.mayoclinic.org/drugs-supplements/thyroid-oral-route/precautions/drg-20069086, last accessed March 21, 2016.
http://www.hormone.org/diseases-and-conditions/thyroid/lifestyle-and-prevention, last accessed March 21, 2016. “5 Easy Lifestyle Changes for Living Better with Hypothyroidism,” HealthGrades web site; http://healthguides.healthgrades.com/tuning-up-an-underactive-thyroid/5-easy-lifestyle-changes-for-living-better-with-hypothyroidism, last accessed March 21, 2016.